Limestone is a very common sedimentary rock consisting of calcium carbonate (more than 50%). It is the most common non-siliciclastic (sandstone and shale are common siliciclastic rocks) sedimentary rock. Limestones are rocks that are composed of mostly calcium carbonate (minerals calcite or aragonite). Carbonate rocks where the dominant carbonate is dolomite (calcium magnesium carbonate) are named dolomite rock. 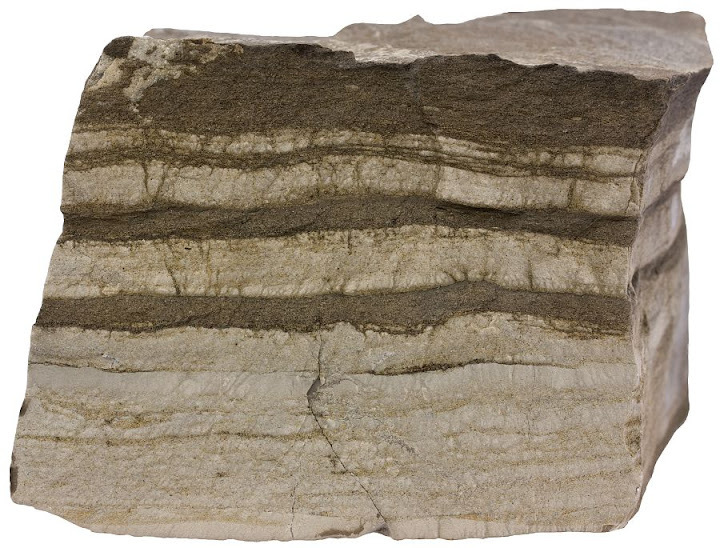 Carbonate rocks together make up one-fifth of all sedimentary rocks in the stratigraphic record3. Varieties of limestone. Chalk (upper left) is a marine limestone consisting of tests of microscopic algae and foraminifera. Tufa (upper right) is a chemical precipitate of calcium carbonate. Fossils are very common in marine calcitic sedimentary rocks. Rocks such as coquina are wholly composed of fossils but so-called normal limestones may be also highly fossiliferous. The sample (lower left) is from the Ordovician. Grainstone is a coarse-grained grain-supported variety that contains almost no limy mud (micrite). Limestone is defined by these two criteria: it is a sedimentary rock (1) and it is composed of calcium carbonate (2). There are other rocks that are composed of calcium carbonate. Carbonatite is a rare type of igneous rock and marble is a common metamorphic rock. Both are chemically composed of calcium carbonate, but they are not limestones because they are not sedimentary rocks. Other than that, there are no more restrictions. Hence, limestones can be, and indeed are, formed by very different mechanisms. Some limestones are clastic (or detrital) just like sandstone. However, there is an important difference. Most detrital limestones are made of biogenic grains rather than weathered bits and pieces of preexisting rocks. Calcium carbonate in the form of aragonite and calcite are extremely common biominerals. They are used to build tests, shells, exoskeletons, etc. of millions of marine (mostly) species. These tests sink to the bottom of oceans or other waterbodies and form a limy sediment (named ooze if the tests are microscopic) which becomes limestone after burial and lithification. 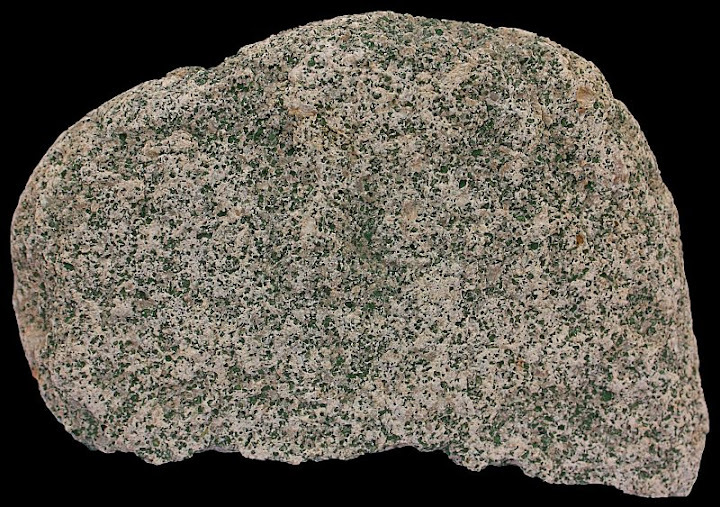 However, some detrital limestones (oolites) are composed of abiogenic particles like ooids. Biogenic limestone may grow in situ by the growth of carbonate skeletons (coral reefs) or by trapping of sediments in bacterial mats (stromatolites). Limestone formations are usually clearly layered. 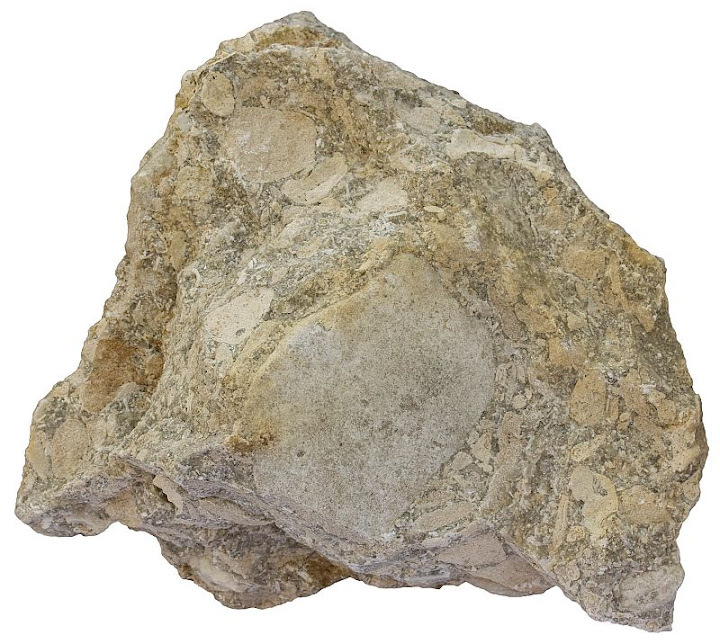 Pure rock is light-colored. An outcrop of Silurian limestone in Saaremaa, Estonia. Stevns Klint in Denmark is a world-famous K-T boundary. It is composed of bryozoan limestone (upper part) and chalk (lower) which are both types of limestone. These layers are separated by a narrow layer of clayish material which formed 65 million years ago. The clay is very rich in iridium – a metal abundant in iron meteorites but rare on Earth. This layer formed as a result of meteorite explosion on the Yucatán Peninsula in Mexico. The event marks the end of the Mesozoic Era and is associated with the mass extinction that also ended the reign of dinosaurs. Dark gray spots are chert nodules and the boulders on the coast are also made of this rock type. Limy mud is often purely chemical precipitate. Tufa and travertine are varieties of chemical limestones. Tufa is soft and porous variety that is associated with springs. Ground water may contain thousand times as much carbon dioxide as would be in equilibrium with air4. Such groundwater is acidic and dissolves limestone. Limestone (or more precisely limy mud) precipitates out of ground water when it emerges above ground as a spring and loses much of its CO2. Travertine is a hard variety of chemical limestone. Travertine is the material speleothems (stalactites, stalagmites, and other dripstones) of karst caves are made of. Travertine formed in these caves is simply the result of a complete evaporation of water containing mainly calcium carbonate. Travertine deposited from hot springs may be a result of the loss of carbon dioxide from the water as pressure is released upon emerging at the surface5. 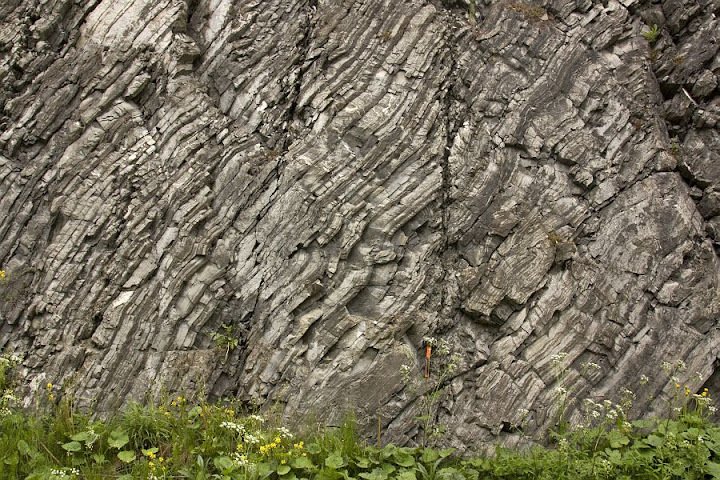 Limestones are strongly affected by diagenetic processes that accompany lithification. Aragonite will be replaced by calcite (if the original carbonate mineral was aragonite), dissolution may be significant (there is a picture of stylolite below), and calcite may be replaced with dolomite. However, calcite is resistant to metamorphism. Marble is a metamorphosed limestone, but it is still composed of carbonate minerals. The crystals are just bigger, they are recrystallized, and original structures (like fossils) are obliterated. Limestone is often impure. Calcium carbonate may be mixed with siliciclastic material (clay, sand) in all proportions, but calcium carbonate must form the majority. Otherwise, we have calcareous sandstone or marl instead of limestone. The term “marl” is mostly used in the field and often somewhat muddy limestones, even if they contain more calcium carbonate than mud, are called that way. Limestone has many industrial uses. It is used as a building material, as a raw material in the manufacture of portland cement, quicklime, etc. Calcium is an important micronutrient. Several commercial drugs (antacids and calcium supplements) are nothing but pulverized limestone (calcite)6. It is an important reservoir rock of crude oil and gas. Limestone is often rich in fossils. Sea lilies (attached crinoids) are echinoderms that are not extinct, but their best days have passed. They were so abundant during the Paleozoic that many limestones are full of their fossils. Bits of crinoids in a limestone slab from the Ordovician of Estonia. Limestone from the Ordovician of Morocco containing lots of nautiloid fossils. Limestone drill cores from Hiiumaa, Estonia. An outcrop of limestone in Biri, Oppland, Norway. Hammer for scale. 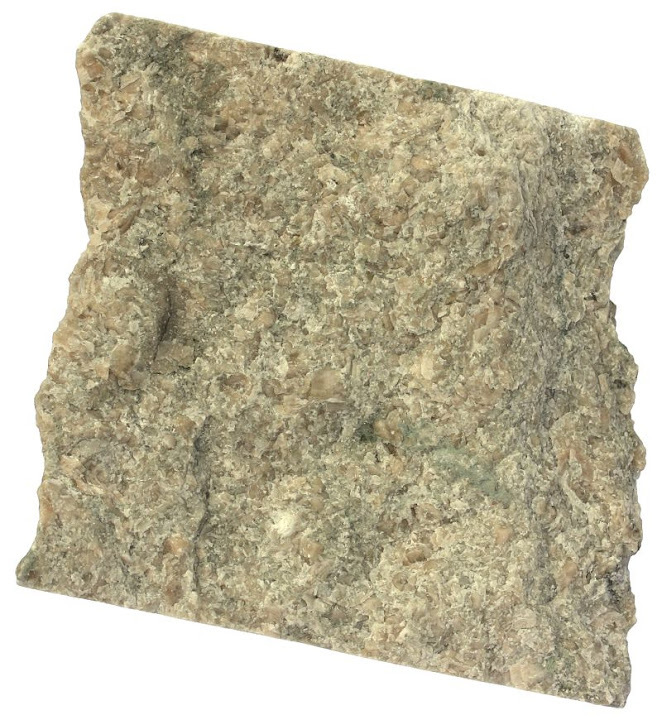 Coarse-grained limestones are known as grainstones. The sample is from Estonia (Ordovician). Width of sample 10 cm. 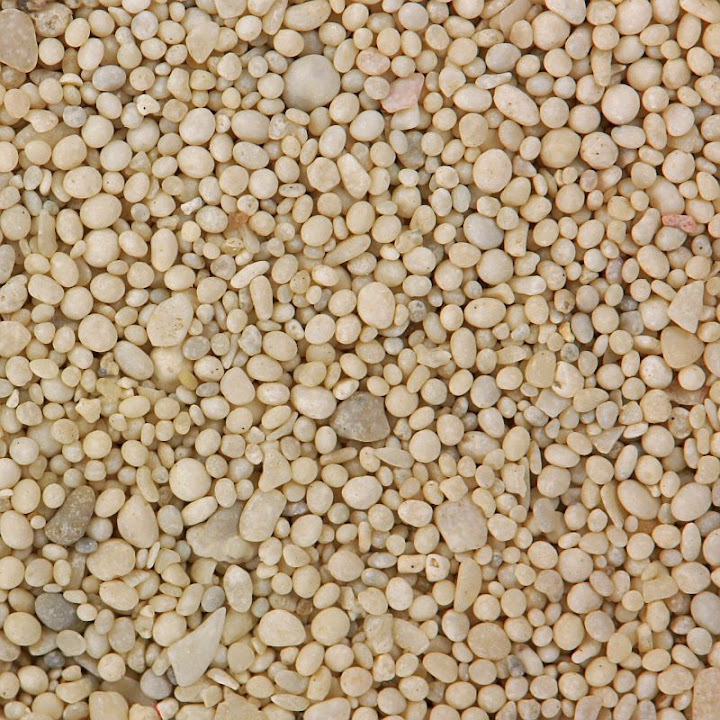 Tufa is a chemically precipitated soft and porous limestone usually associated with springs. The hard variety of tufa is travertine. The sample from Estonia is 13 cm in width. Green lithic fragments are pieces of glauconitic sandstone. 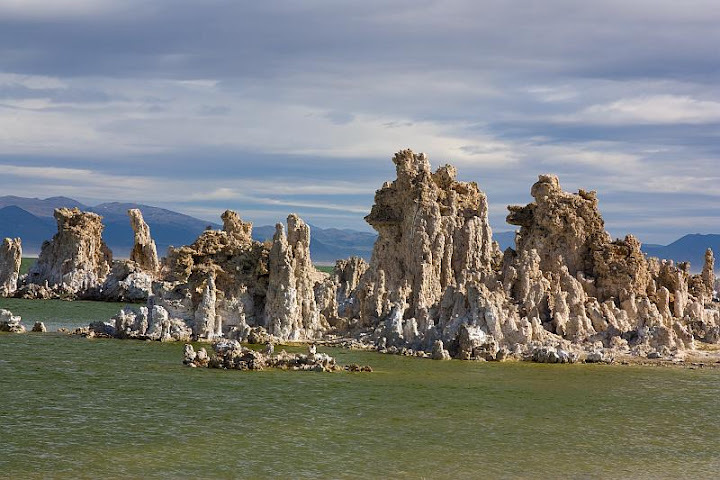 Tufa towers in Mono Lake, California. These limestone formations grew in the lake when the water level was higher. Mono Lake is a soda lake. Its water is also rich in carbonate ions. Springwater that enters the lake water carries dissolved calcium which reacts with carbonates and precipitates as tufa. Despite being composed of calcium carbonate, this rock sample is not limestone because it crystallized from magma. 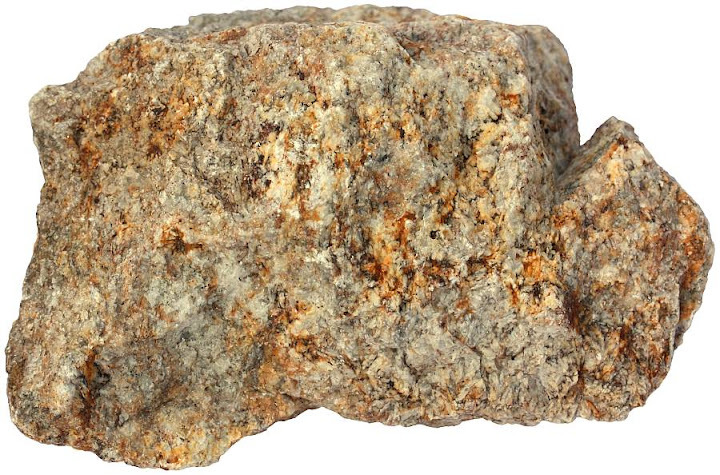 This is rare igneous rock known as carbonatite. The width of the sample from Germany is 8 cm. Impure sandy limestone. 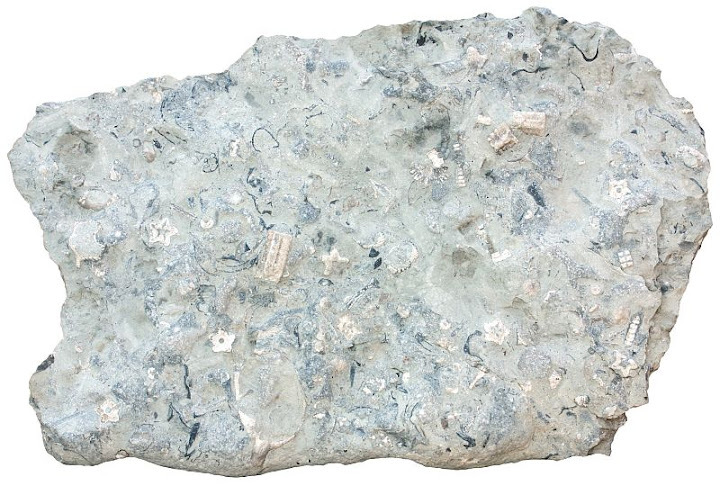 Carbonate minerals have to form the majority of the rock in limestone. 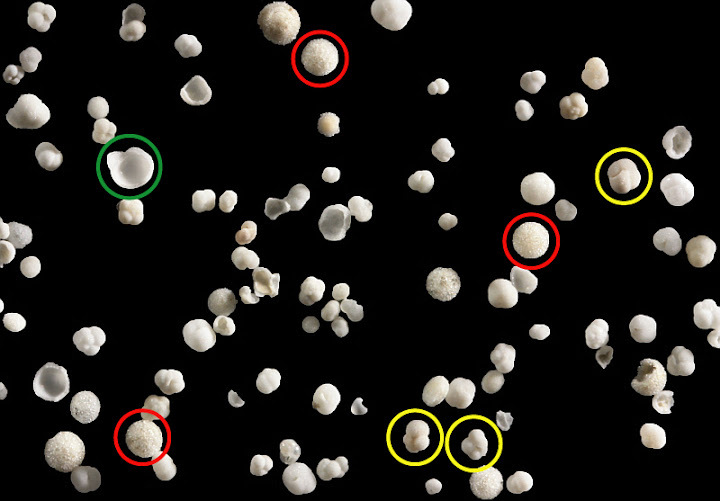 A close-up of foraminifera tests. Genera of foraminifera Calcarina, Sorites, and Baculogypsina from left to right. Width of view 10 mm. Globigerina ooze is a type of foraminifra ooze (globigerina is a genus of planktonic forams) that covers large areas of seabottom. 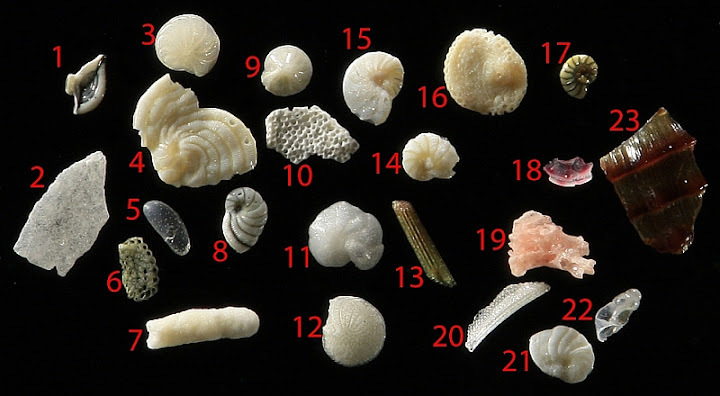 These forams are collected from the Weddell Sea near Antarctica. They covered seafloor at the depth of 3500 meters. 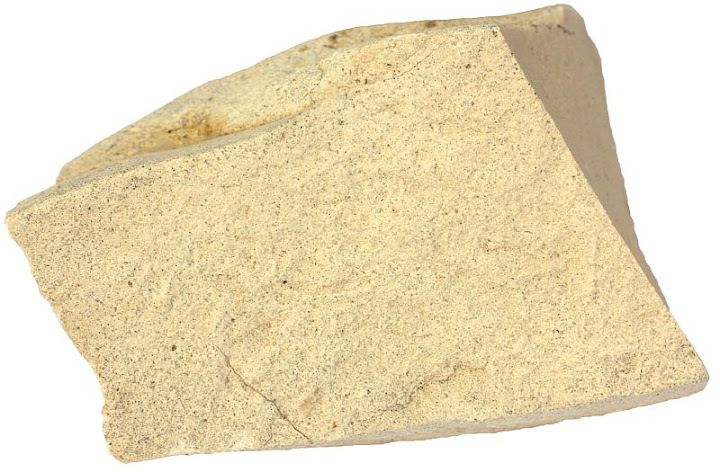 This coarse-grained limestone from Cyprus shares both sandstone and limestone properties. It is clearly clastic like sandstone, but it is composed of carbonate grains of biogenic origin. Such rocks are known as calcarenite, they are considered to be a subtype of limestone. The width of the sample from Cyprus is 7 cm. An outcrop of calcarenite from Cyprus. Layer of coquina in a calcarenitic limestone in Morocco (coastal cliff between Essaouira and Agadir). 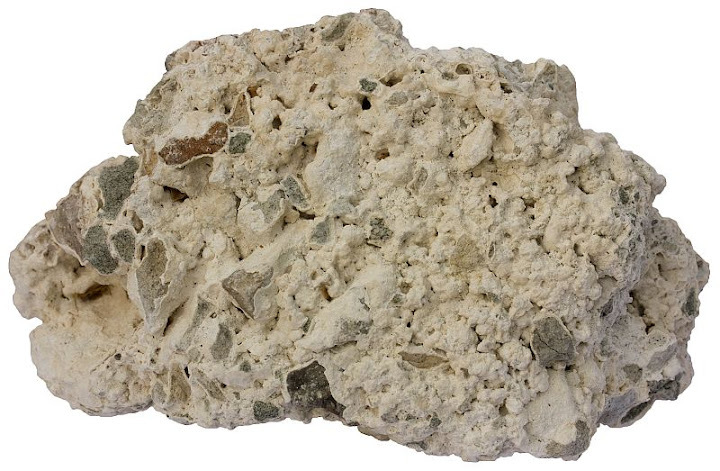 Coquina is a type of porous limestone that is chiefly composed of fossil debris. Width of view 40 cm. 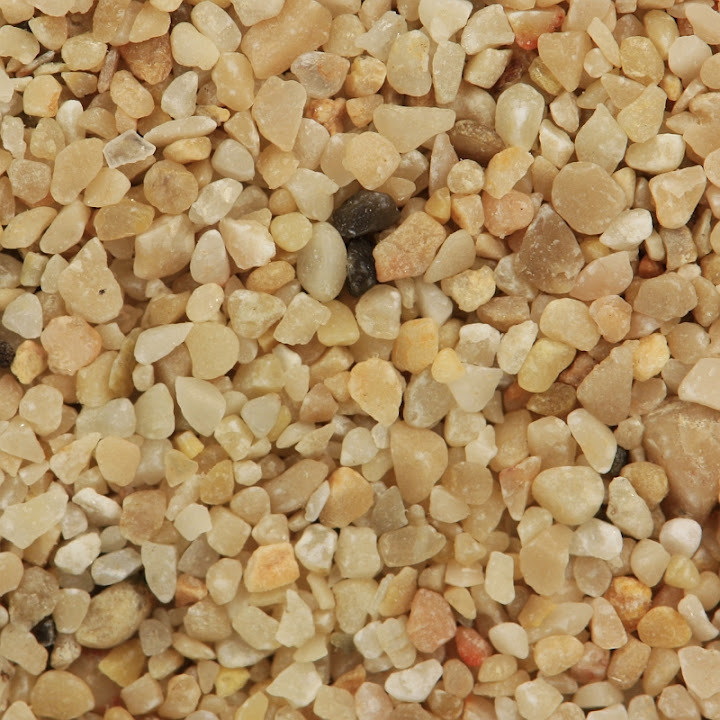 Ooid sand from Abu Dhabi, The United Arab Emirates. The width of the view is 5.5 mm. 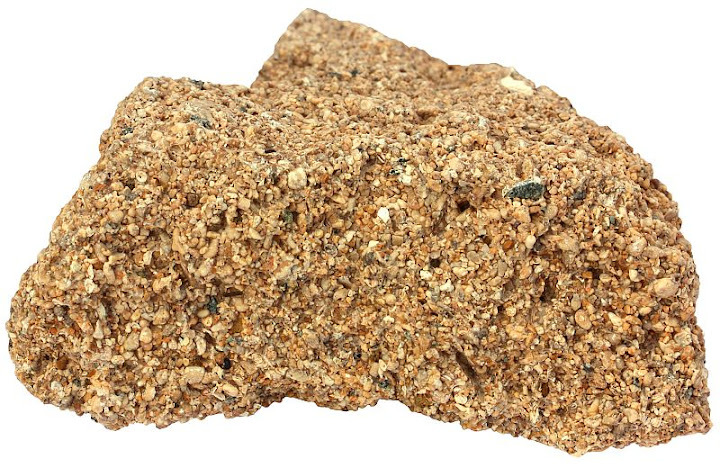 Oolite is a lithified ooid sand. Glauconitic limestone from Estonia (Ordovician). Limestone with a significant amount of clay minerals is known as marl. Tempestite is a storm deposit. Limestone bed was severely disturbed by sea waves in shallow water, but the broken off pieces redeposited quickly and lithified again as a brecciated limestone. The sample from Estonia is 13 cm in width. An outcrop of limestone with a tempestite layer in Estonia from the Silurian. The width of the view is approximately 40 cm. Marly (impure clayey limestone) chalk from Cyprus. Width of sample is 7 cm. Coral sand from Bermuda. Pink grains are tests of foram Homotrema rubrum which give pink color to the sand of Bermuda. The width of the view is 18 mm. 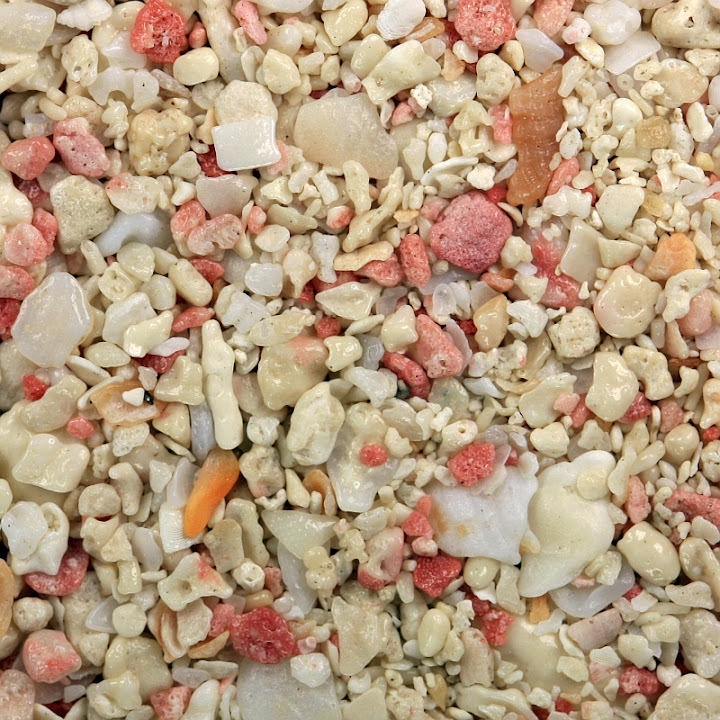 Coral sand consisting of pieces of corals and foraminifera from Hawaii. The width of the view is 16 mm. Miscellaneous biogenic grains (forams, gastropods, sea urchins, ostracods, clams, coralline algae) from the beach sand of Zakynthos, Greece. Sand sample consisting of limestone fragments. The sample is from the Krk Island, Croatia. Boulders of chalk laying on the White Park Bay beach in Northern Ireland. Chalk is a type of limestone consisting of tiny marine microorganisms coccolithophores which just like foraminifera have a calcareous tests. Coccoliths (tests of coccolithophores) are significantly smaller than foram tests. An outcrop of chalk in Cyprus. Chert nodules in chalk. The outcrop is in Northern Ireland. Holes in chalk were probably created by boring molluscs which prefer limestone substrate and bore into the rock with the aid of an acid secretion. Brecciated travertine in Death Valley. Width of view 30 cm. Shingles of limestone on the southern coast of Cyprus. Layers of mudstone (dark) in limestone. Biri, Oppland, Norway. Width of sample 9 cm. Alternating layers of chalk and marly chalk in Cyprus. A reef knoll (microbial biolithite) in Cyprus. 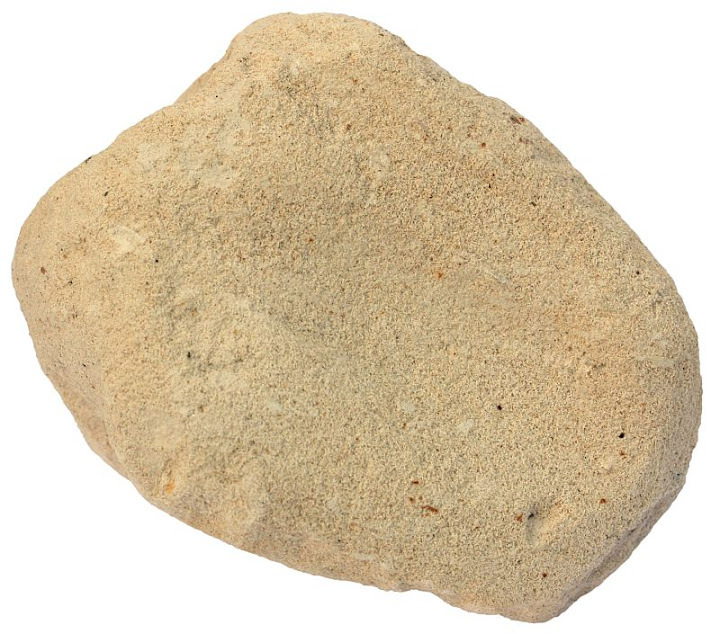 Biolithite is a limestone constructed by organisms that grew and remained in place1 (coral reefs, for example). Stromatolite in Saaremaa, Estonia. Stromatolite is a sedimentary structure produced by sediment trapping and binding by microorganisms (mostly cyanobacteria). Large boulder or crystalline rock (glacial erratic) is about to fall into former karst cave with a collapsed roof in Ordovician limestone. Kostivere, Estonia. A limestone pavement in the Pyrenees (Spain) showing evidence of karst dissolution. Raised beach in Northern Ireland. Notches (wave-cut caves in rocks, most commonly in limestone2) are now well above the waterline because the coast in Northern Ireland have risen after the glaciers of the last glacial epoch receded. An outcrop in the Pyrenees, Spain. 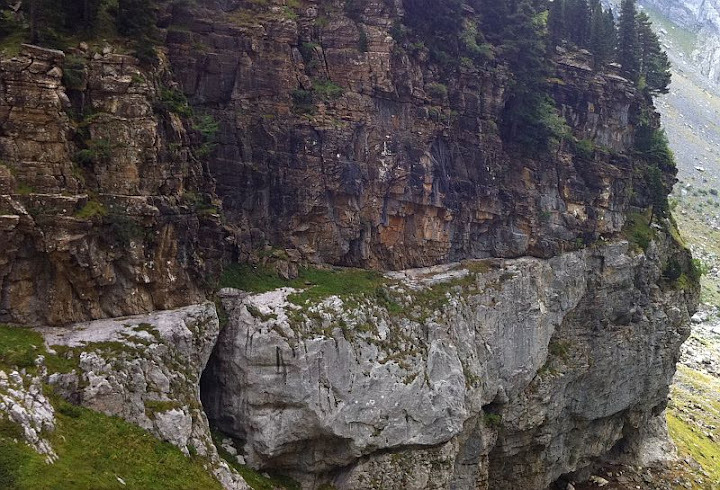 Older siltstone formation is pushed on top of younger limestone formation. Description of this outcrop is here: How the Pyrenees were made. Dolomitic Durness limestone from Scotland. Brachiopod fossil (Spirifer) from the Paleozoic limestones of Canada. Brachiopods were once very widespread and their fossils are common in older limestones, but nowadays they are not as successful as are clams. Clams resemple brachiopods in morphology but the two are unrelated taxons. Stromatoporoids (not to be confused with stromatolites) from the Silurian of Estonian bedrock. Stromatoporoids were important reef-builders of the Paleozoic. They were probably related to sponges and not to modern reef-builders corals. Width of sample 10 cm. 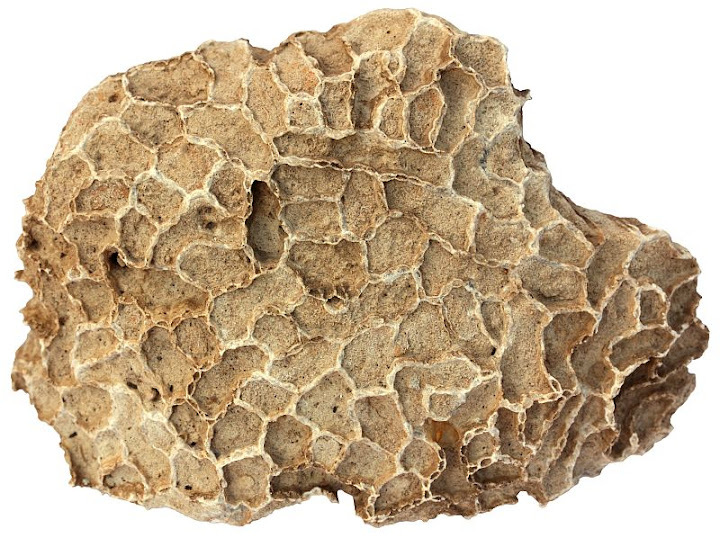 Tabulates are an extinct order of corals that were widespread reef-builders during the Paleozoic. The width of the sample from Estonia is 8 cm. Nautiloids were once very common in oceans, but today they are represented by few species of family Nautilidae. They are cephalopods, related to octopuses. This fossilized nautiloid from Estonia (width 17 cm) lived during the Ordovician period. Nautiloid fossils are very common in certain Estonian limestones. And another nautiloid fossil from Estonia. 1. Jackson, J. A. (1997). Glossary of Geology , 4th Edition. American Geological Institute. 2. Trenhaile, A. (2004). Notch, coastal. In: Encyclopedia of Geomorphology (Goudie, A. S.). Routledge. Volume 2. 725. 3. Stow, D. A. V. (2005). Sedimentary Rocks in the Field: A Color Guide . Academic Press. 4. Barnes, I. (2007). Spring (hydrology). In: McGraw Hill Encyclopedia of Science & Technology , 10th Edition. McGraw-Hill. Volume 17. 303-304. 5. Siever, R. (2007). Travertine. In: McGraw Hill Encyclopedia of Science & Technology , 10th Edition. McGraw-Hill. Volume 18. 606. 6. Nesse, William D. (2011). Introduction to Mineralogy , 2nd Edition. Oxford University Press. I echo Zac’s comments: another great post, with awesome photos! This is a fantastic educational resource. I wonder if you considered discussing the more popular classification schemes for naming limestones (e.g. Folk, 1962; Dunham, 1962 with later modification by Embry & Klovan), like you’ve done for igneous rocks. I notice you used a few of these names (grainstone, micrite, biosparite) in your discussion. One other comment: your photo of the “honeycomb or tafoni weathering in chalk” might have an alternate interpretation. These circular holes might be created by boring molluscs, such as the pelecypod genus Lithophaga sp., which prefers limestone substrates and bores into the rock with the aid of an acid secretion. I thought about classification principles but the article was already very long. I decided to leave it out for now. In the future I plan to write an article titled “Classification of limestone”. Another reason for leaving it out was that I simply do not have illustrating material for all the names mentioned in these classifications. It has to wait its right time. The same is true with sandstone article. I plan to write an article titled “Types of sandstone” because this topic clearly demands more attention than I paid to it. Yes, I believe your interpretation about the mollusc holes is correct. I’ll change the caption. It is wonderful to have readers who educate me just like I attempt to educate my readers. I am glad if Sandatlas is an educational resource for my readers. This is what I attempt to achieve. It may be surprising for some but I think that I learn the most while preparing and writing these posts. I learn new facts every time I write. Wow. I am blown away by this post. So concise and informative! Keep up the good work!! Great post!!! Very thorough and complete! Firstly, let me say that your website is wonderful for me because I am passionate about geology but I am still a novice on this domain ;). So, thank you for all of your articles! 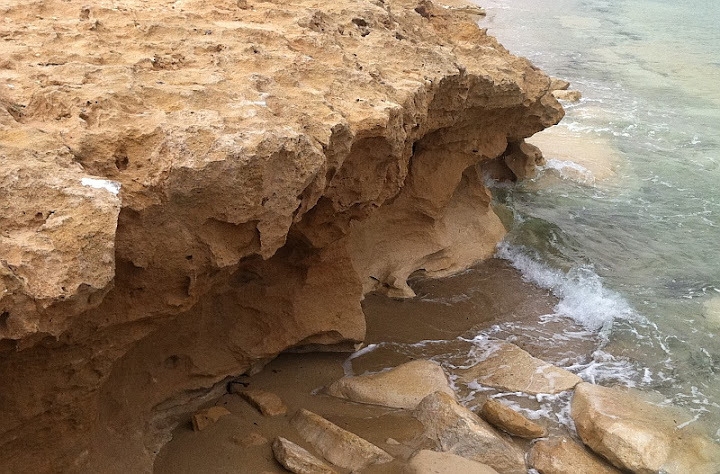 I was reading your article about limestone (here: https://www.sandatlas.org/2012/10/limestone/) and in this article there is a term I have never heard of (again, I am interested in geology since shortly): “Shingles of limestone on the southern coast of Cyprus”. English is not my mother tongue (I am French), so there are lots of words and terms that I don’t understand fully. 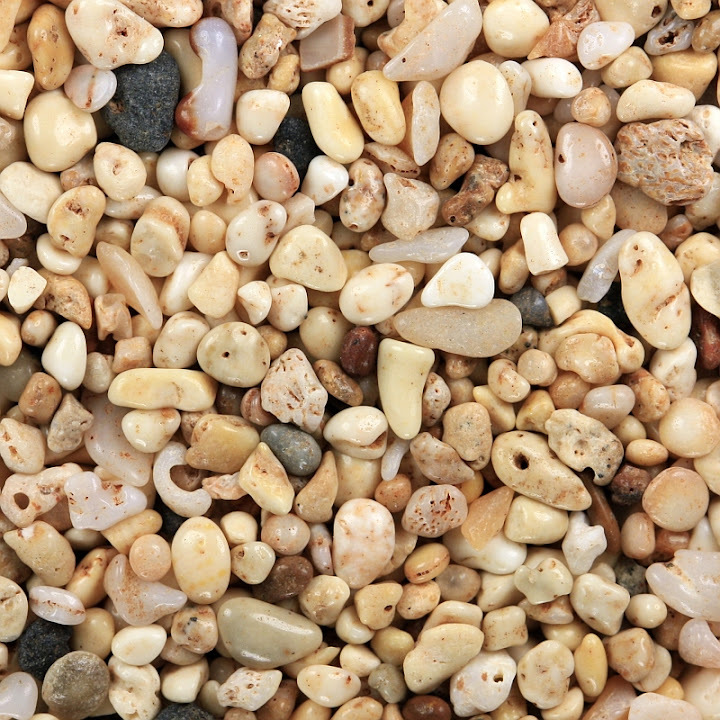 I looked on Wikipedia to read about the word “Shingle” and now I know that it means a beach composed of pebbles. But now here is the part that I really don’t understand: “Shingles of limestone”. I didn’t know that pebbles could be made of limestone because I have always thought limestone would be too soft to withstand erosion by sea water. Could you explain to me how these limestone pebbles can form and how limestone pebbles can resist erosion? Question: can anybody explain me why the old buildings made of limestone are getting dark, respectively black ? What kind of chemical reaction is it?? Thank you. It is probably rock varnish. This is very general term that encompasses clay minerals and various oxides/hydroxides precipitated on the rock’s surface.